In late September, two brothers began a long journey to the Middle East. On this page we will publish information on meetings and prayers in which they will participate, and echoes of their visits. The visit of two brothers to the Middle East continues. Below, you can find new echoes of their visits to refugees in Jordan. Before Christmas, Brother Alois also arrived in the Middle East. 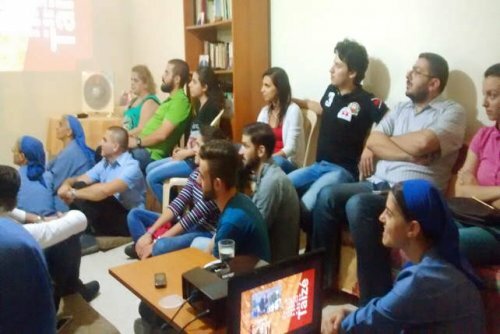 The brothers led an evening of prayer on Friday, December 18 in Beirut, Badaro. After six weeks in Lebanon and two weeks in Egypt, we arrived in Amman, Jordan. One of the first things we did here was to visit the UNHCR, the UN refugee agency. This visit allowed us to better understand the situation of the refugees in the country. As in Lebanon, most of Jordan’s refugees are from Syria. In Jordan, there are currently 630,000 registered refugees from Syria. Added to this are 60,000 refugees from Iraq and 7,000 from Sudan, Somalia and other countries. We have also visited another organization working with refugees, the "Jesuit Refugee Service." With them we are visiting families who have fled from war in neighboring countries. We had already made such visits during our previous stay in Lebanon, to refugee families from Iraq and Syria. For these visits, we accompany one or other of the volunteers who, for months, have regularly been visiting the families. Through such visits, we can really see the living conditions of the families. The life of refugees is extremely difficult. Many of them have had to leave their homes, their country, hastily, fleeing danger and leaving everything behind. For some, the only things they could take with them were the clothes they were wearing. Many of them, especially women and children, were injured and severely traumatized by the violence they have witnessed in their country. Children suffer enormously. In some cases, they cannot go to school. So a whole generation is not receiving the basic education they need for the future. There are also children who have to work to earn some money for their families. Of the four million refugees from Syria in the Middle East, two million are children. Daily life in Lebanon is marked by a climate of permanent tension and war that reigns over the entire region. With the arrival of thousands of refugees - mostly Syrians - a general tiredness and sometimes a feeling of discouragement are noticeable throughout the country. Fortunately, outside the often discredited political parties, there are also people who, through various groups or associations, show that it is possible to live in peace and help to develop solidarity between people, respecting diversity, including religious differences. We had a very good meeting with an association called Adyan, which means “Religions”, founded by a group of Christians and Muslims. They managed to establish March 25, feast of the Annunciation, as a holiday for both Christians and Muslims, as the Virgin Mary is also venerated by Muslims. These young people want a future of peace for Lebanon, a future to build together, Muslims and Christians. From the first days, we were able to visit refugee families living in poor housing in Beirut. Each time you find several families with children who have to share one or more common rooms. All these families have recently experienced great trials when they fled. The families told us of many horror stories and scenes of cruelty. Another morning, we went to visit Chaldean families who fled Iraq during the bombing of their city, Mosul. Their life in Beirut is not easy: several families have to live together in order to be able to pay the rent to owners who profit from their situation. They have the difficulty of finding an employment; the work available is hard and poorly paid. It is hard and sometimes impossible to send their children to school. Last night, in a working-class area outside of Beirut, we had a very good meeting with the Little Sisters of Jesus and a group of about 25 young people they had invited. It was a mosaic that represents the diversity of the population living in Lebanon—Lebanese, Syrians, Egyptians, Armenians and Iraqis.